Is there something about your teeth that bothers you, and you think should be improved, so that your smile looks a lot better? Are you concerned of undergoing invasive or complicated procedures to improve the appearance of your smile? If you answered yes to these questions, then you might want to consider going for dental veneers – which can bring about the necessary aesthetic improvements on your teeth, without including invasive or complicated procedures. 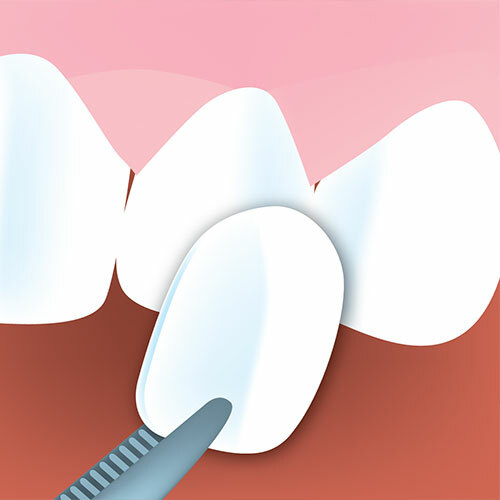 Dental veneers are made of very thin pieces of porcelain, which are attached to the visible surface of your tooth. These porcelain shells are custom-made to very closely resemble the appearance of your natural teeth, so that no one will need to know that you have dental veneers on (unless you make the announcement yourself!). Dental veneers are used mostly for the front teeth, where damage or discolourations can easily be seen when you open your mouth, or when you smile. Porcelain veneers are known for their strength, and are not prone to staining – so you can be sure that you will enjoy your much-improved smile for a very long time (of course, combined with proper oral health care habits, and regular visits to the dentist). Stained or Discoloured Teeth – Stains or discolourations can make teeth unattractive, especially if these unsightly discolourations are on the teeth that are visible when you smile, or when you open your mouth. Dental veneers can effectively address issues of discoloured or stained teeth by covering the unsightly parts with the porcelain veneers, making the affected teeth look healthy and stain-free once more. Dental veneers are great solutions for stains or discolourations on the teeth that do not respond positively to teeth whitening treatments. Damaged Teeth – The damage on teeth left by tooth decay can be addressed effectively with dental veneers. Other damage on the teeth’s surfaces, such as cracks, chips, or misshapen appearances, can all be improved with the help of dental veneers – which will improve the appearance of the affected teeth by covering the unsightly areas with a thin porcelain shell that resembles the appearance of natural teeth. Crooked Teeth – Teeth that are crooked or improperly aligned can be addressed with dental veneers – especially if the problems in alignment do not need major work, or if you do not want to go through a long orthodontic treatment. The affected teeth can be covered with the dental veneers, so that they appear to be more properly aligned with the rest of the teeth. Spaces Between Teeth – Unsightly spaces or gaps between teeth can be improved with the help of dental veneers – resulting in smiles that feature teeth that look more evenly-spaced.